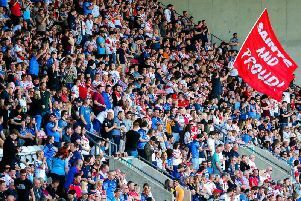 Saints have named their 19-man squad for Friday’s First Utility Super League round six clash with triple-trophy holders Leeds Rhinos at Headingley on Friday night. Travis Burns, Andre Savelio and Jack Owens are recalled for injured winger Adam Swift, Jack Ashworth and Morgan Knowles. Leeds have been given a major boosts by the return of skipper Danny McGuire from a knee injury which had been expected to keep him on the sidelines until next month. 2. Tommy Makinson, 3. Jordan Turner, 6. Travis Burns, 7. Luke Walsh, 8. Alex Walmsley, 9. James Roby, 10. Kyle Amor, 11. Atelea Vea, 12. Jon Wilkin, 13. Louie McCarthy-Scarsbrook, 14. Lama Tasi, 15. Greg Richards, 16. Andre Savelio, 17. Luke Thompson, 18. Dominique Peyroux, 20. Joe Greenwood, 21. Matty Dawson, 22. Jack Owens, 23. Shannon McDonnell. 1. Zak Hardaker, 3. Kallum Watkins, 4. Joel Moon, 5. Ryan Hall, 6. Danny McGuire, 7. Rob Burrow, 8. Keith Galloway, 9. Beau Falloon, 10. Adam Cuthbertson, 11. Jamie Jones-Buchanan, 12. Carl Ablett, 14. Liam Sutcliffe, 15. Brett Delaney, 16. Brad Singleton, 17. Mitch Garbutt, 20. Anthony Mullally, 21. Josh Walters, 22. Ash Handley, 26. Brett Ferres. The game kicks off at 8pm and the referee will be Ben Thaler.